Hi! Lovely Blog Followers! Look what the Kat dragged in. Yep, none other than rockin' high-fallutin' sock-em-to-me author Deeeeennnaa Siiillveeeer!!! 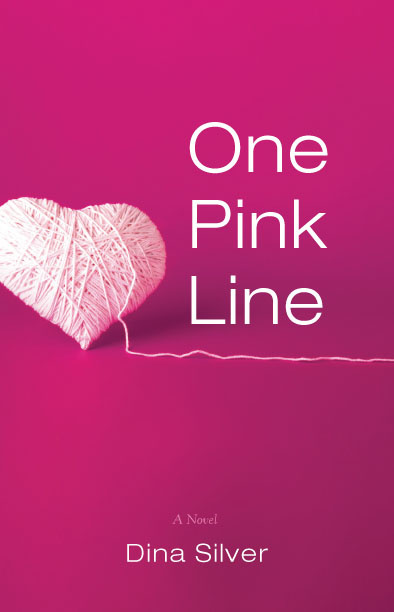 Dina’s first book, One Pink Line, caught my eye with the simplistic cover and the ominous words describing a pregnancy test. Depending on which side of the marriage fence you are, that pink line could either spell pure joy or unmitigated disaster. So Dina, tell us, what made you decide to write a novel about a pregnancy test? Once I knew there was a back-story, I became even more annoying with my line of questioning, and she opened up to me and told me about herself, her youthful indiscretion, and ultimately shared what I thought was a truly wonderful love story. Folks, fair word of warning. *whispers* (don't let the Kat out of the bag while having tea with Dina, you know, she was just sort of prying?) One Pink Line has become quite a bestseller. Would you attribute your success to your husband’s 4-star review and empty stomach? Okay, seriously, what’s your secret? We’re all awaiting with bated breath. Ha! I’m so glad you mentioned his review (he’s quite proud of himself), and it now has it’s own fan base. I attribute my success to many, many factors. The first and foremost being that I wrote a mildly entertaining, relatable book. Because (in my opinion) at the core of any book’s success, there has to be a good story, and one that readers can rally behind. Especially in the genre of women’s fiction. Also, I spend an ugly amount of time researching the industry, marketing my book, commiserating with other authors, reaching out to bloggers, speaking at local book clubs, and begging people to leave reviews for me. Before I decided to put my words into long form, I worked in advertising for 15 years. Those experiences have left me with a great deal of knowledge on how I wanted to brand myself and my work, and I truly believe that has helped me immensely in the area of promotion where One Pink Line is concerned. Great background you have for self-publishing! Personal experiences aside, what made you write Kat Fight? Kat Fight was in my head as a screenplay for about two years. I used to go jogging and imagine the scenes playing out in live action all the time. After I initially sat down to write it as a screenplay, a good friend of mine convinced me I’d have more luck getting published as a novel first, so I took her advice and wrote a book instead. I really wanted to write a true romantic comedy, just a fun read with a great love story woven throughout. I like a good laugh, and I think comedy is so challenging, so I wanted to attempt it for myself. I actually LOVE reading murder mysteries! I wish I could write a good suspense novel, but I don’t think my confidence is in that arena. Up next I’m writing a story that takes a light hearted look at a serious topic. Well, DO keep us guessing! You owned a greeting card company. How has writing cute ditties and sentimental slop helped you with your storytelling? What? I insulted you? Have another glass of wine? Yes, and yes! It’s called Dinas Ideas (genius name, I know), and I started it about ten years ago, right after my son was born. Working in adverting and writing greeting cards has given me a knack for writing titles. Short & sweet is how I like them. I always try to challenge myself to say the most about something, with the least amount of words. *wiping wine off my face* Must make you a fantastic tweeter. J Tell us a bit about your hobbies. What do you like to do when you’re not embroiled in a literary storm? I don’t like to exercise, but I try to. Especially in the summer, I love walking and riding my bike. I’m also a huge film addict, and enjoy going to movies by myself in the middle of the day. Whew! That was a safe question. Now, for some free association. I bet you didn’t know what you were getting into, eh? Blue jeans or slinky red dress? - Jeans!! On that note… I think we survived. Thank you for being a guest on Rachelle’s Window, a place where we peer into your naked soul. It was my pleasure, thanks for letting me ramble! 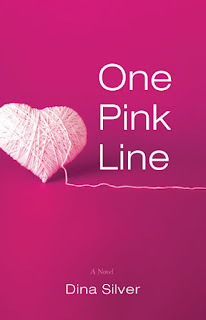 Check out my reviews of One Pink Line and Kat Fight! Shameless Self-Promotion. Please vote it up, and yes, I'm using my real name. And, as Dina's husband says, "Buy my wife's books, and buy lots of them." 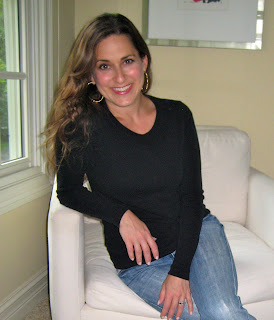 Find Dina lounging at her website. AND!!!!! One lucky commentator is going to receive a real paper copy of Kat Fight in his or her mailbox (you know, that metal contraption that hangs outside your house? not the AOL version). [comments taken until end of July] So please stop by and say "hi" to Dina. Pry into her life as annoyingly as you can. How 'bout it? Hi Dina! Good luck on launching the ebook next week! It was fun chatting with you. Hey Dina, now that me and you entered the giveaway, ya think we'd just swap books and call it even? This sounds like a fun read! Count me in! 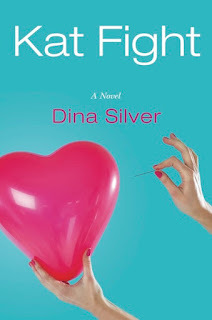 Lindsey is the winner of a paper copy of Kat Fight! Congratulations! I'd love to curl up with a glass of red wine and Kat Fight! Thanks Rachelle for featuring Dina. Kat Fight looks like a great novel! I really do love the simple covers. They are really eye-catching. Great interview, Rachelle and Dina! 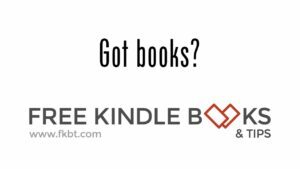 I only just discovered this genre late last year and have been looking for more authors to read. Hi Lynn, look at today's interview with Bonnie Trachtenberg. She is also a funny lady. I do like books that make me even happier than I already am. Too much and I'll fly off into the clouds! Dina's is a surely full of bubbly giggles and so are Bonnie's. "And the most supportive husband of the year award goes to.. Dina's husband" .. LOL. Wow, he really sounds so supportive. I haven't read Kat Fight or One Pink Line but I will DEFINITELY check them out :D What a fun interview. Thanks for sharing a bit of yourself with us, Dina.